When trying to drive improvements in your customer experience, one key is understanding exactly what drives change in the customer’s perception of their experience. Often, identifying these customer experience drivers is the role of market research. 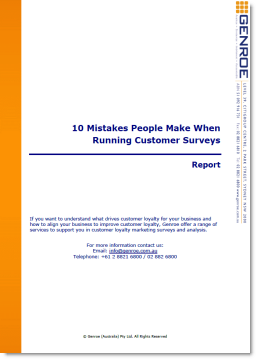 But they can also be uncovered by using customer loyalty surveys in the right way. Once you know what drives the customer experience, you then need to understand (or at least have an idea of) the way that the driver makes changes to the customer experience. There are four basic ways that a driver will cause change in the customer experience. This is what most people assume will be the relationship between the driver and the customer experience. However, in practice, it is probably the least likely to occur. The relationship is simple: the more of the driver the “better” the experience. It can also work in reverse: the less of the driver the “better” the experience. These drivers show a marked change the relationship at the point at which the factor is acceptable but no further improvement for increases in the experience driver after that point. We were working with one organisation in the IT space whose documentation was perceived by customers to be quite poor. We identified this up as a major issue for customers and a driver of customer loyalty. Using this feedback they worked diligently to improve their documentation over a 12 month time frame. When we looked again at the customer data we discovered that documentation was no longer an issue and no longer a drag on loyalty. It had reached an acceptable level, however, subsequent improvements in documentation did not increase loyalty. Many drivers have this profile. Think of errors in bank statements for instance. Customers just expect no errors and just one is going to substantially decrease the customer experience, make two and you will be looking for a new customer. This is the reverse of the hygiene factor. A small change in the experience has a major impact on loyalty. This often happens when a company has a very high value differentiator in their service. For instance, a company with a good web site support system where others had none might experience this type of reaction. We often see this type of response and it is caused most often by the company themselves. A company finds an experience driver that seems to work well, say update emails sent to existing customers informing them of new product information. This has a positive impact on loyalty. So, if once a month is good then once a week, or once a day must be great. Wrong — at a certain point, customers weary of the tactic and it reduces loyalty. In this case having a good customer contact framework can help you to identify the point at which overuse sets in. Once you understand your customer experience drivers and the way that they influence the customer experience you can start to pro-actively design customer experience programs that build customer loyalty over time.